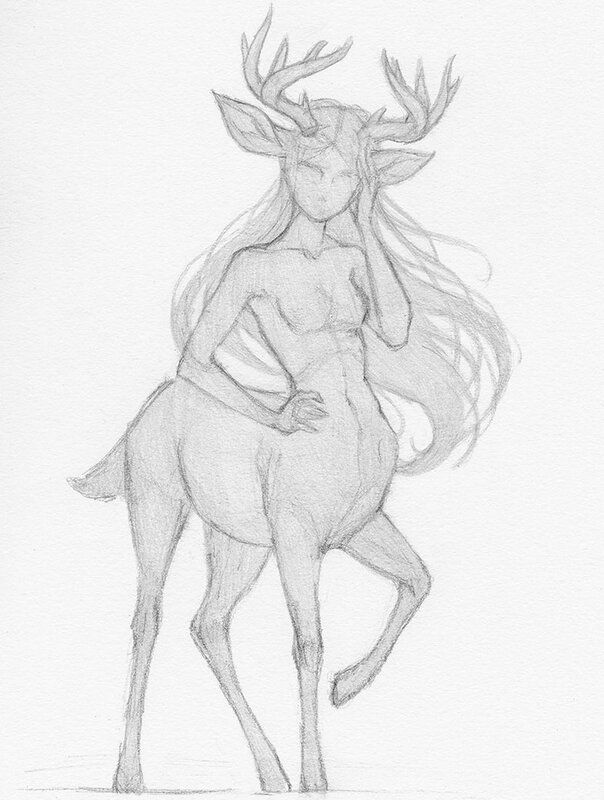 I find half beast creatures very enchanting and interesting to draw, so I have chosen for us to design a cervitaur! 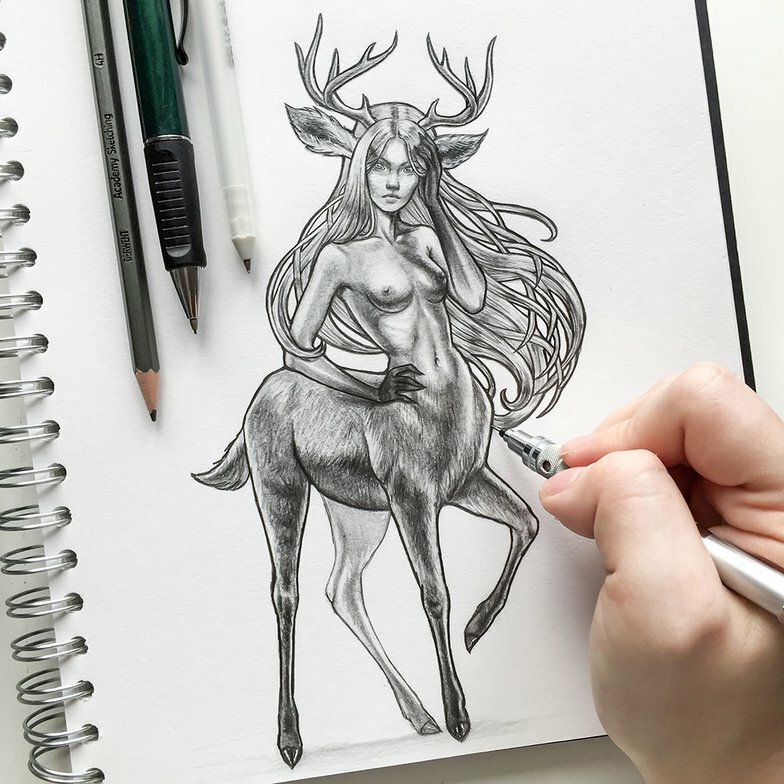 In this tutorial we will be creating our mythological character using a range of pencil strengths that gradually build form and portray lighting. Step by step, I will help you understand how to break down the drawing process which may benefit your workflow. 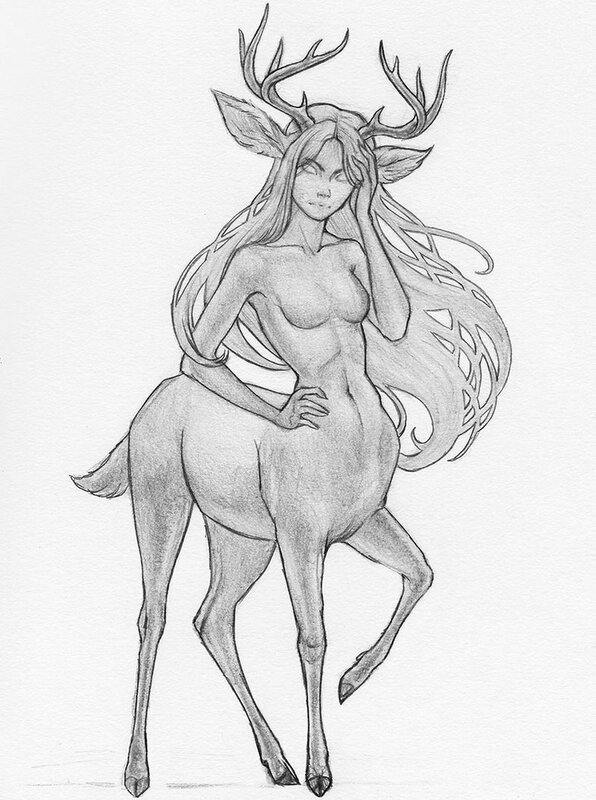 Designing, sketching and rendering a female mythological cervitaur with a range of pencils strengths, an eraser and a white gel pen. 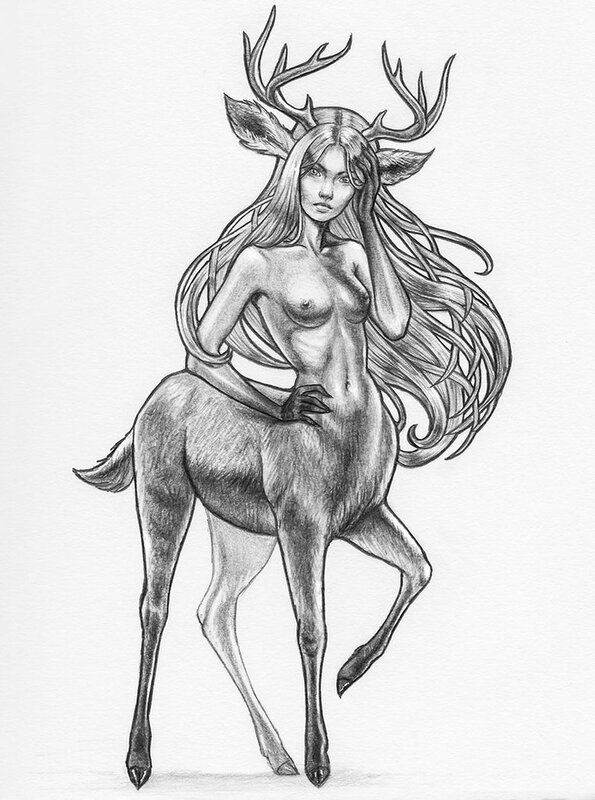 For our first step, we will examine the different types of half ruminant, half human mythological creatures such as fauns and centaurs. 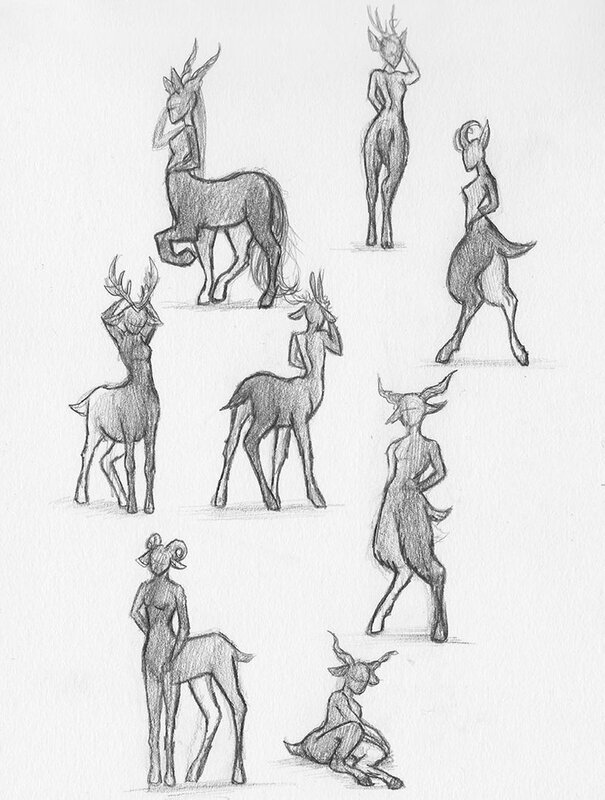 Sketch out the creatures in a range of poses to explore variations. With our collection of thumbnails, we will determine which species we want to run with and which pose is the most appealing. When choosing a thumbnail, think about which has interesting negative spaces, room for further interpretation and a balanced, readable silhouette. Here, I have used an HB pencil for shading and the B Pencil for the strong outline. A collection of thumbnails to explore a variation of species, silhouettes and gestures to choose one to expand on later. Once we’ve chosen our preferred thumbnail, we can then redraw the silhouette slightly bigger. At this stage we can alter a few features that could push the design to make it more engaging, such as changing the position of a limb or two. 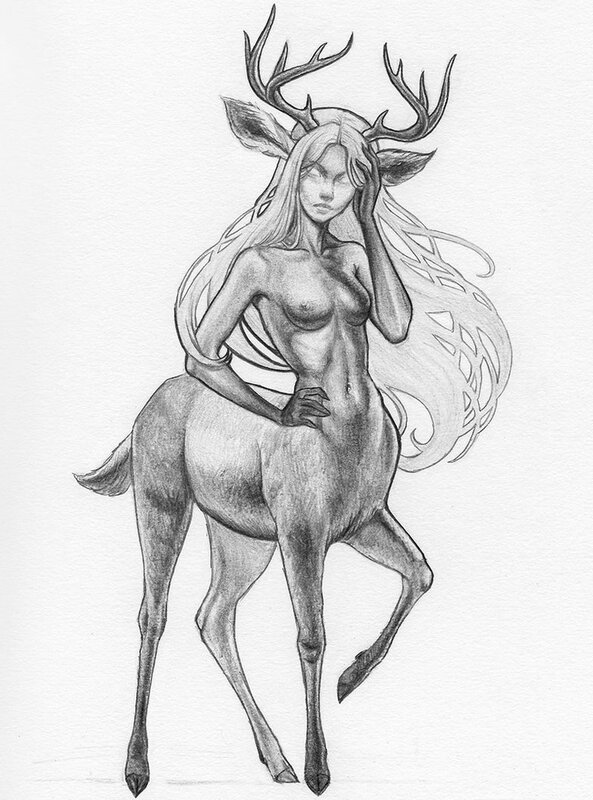 Best practice is to research for the appropriate reference images if you’ve got an idea in mind for the revised pose. 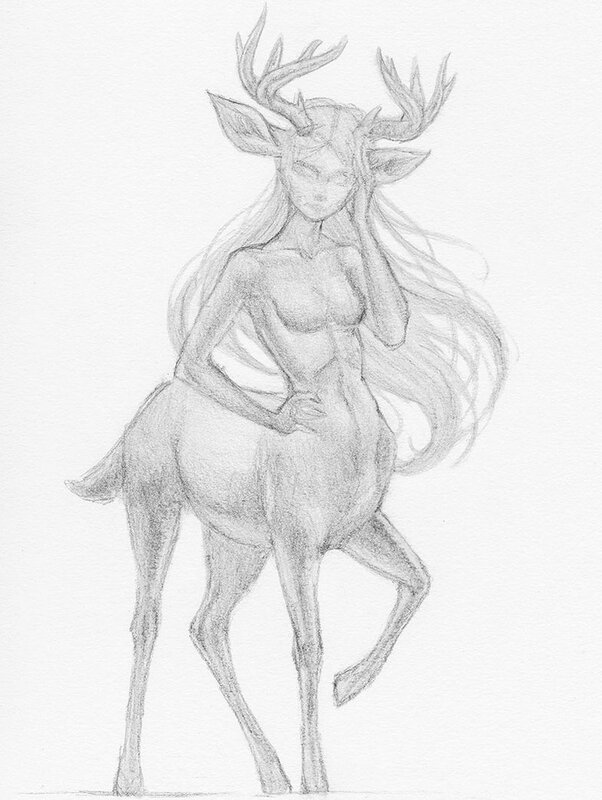 For this sketch I used two references; a female model in this gesture and a male deer. I wanted to keep this draft light and loose, so I used a 4H pencil and a HB for outline. Loosely sketching the chosen thumbnail silhouette with a revised pose to improve aesthetic and balance by using relevant reference material. Using our own draft sketch, along with the other images as reference material, we can make a start on our final drawing by plotting out the initial structure of our creature. 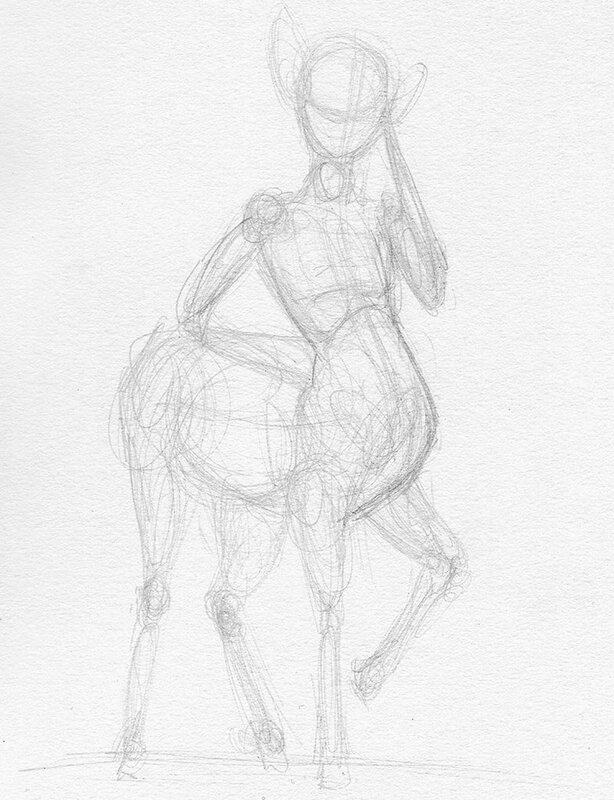 Sketch out very simple, basic shapes to build up the figure and make sure to use a very light graphite pencil such as 4H and keep the pressure to a minimum. This will allow for easy erasing and won’t damage the paper along the way. You can be as messy as you like, making sure to determine the basic silhouette. Using references and the 4H pencil with low pressure, sketch out the basic initial shapes to determine our Flesh out figure with additions figures’ structure. Now we have our initial structure, we can go ahead and lightly outline our character using an HB pencil, still making sure to use minimum pressure. With your pencil, avoid the sharp side of the graphite; use the softer worn down side. Again, this will help you avoid damaging the paper as we don’t want any confident line work yet. We are still in the early stages of establishing the figure and we are likely to be erasing and revising areas. 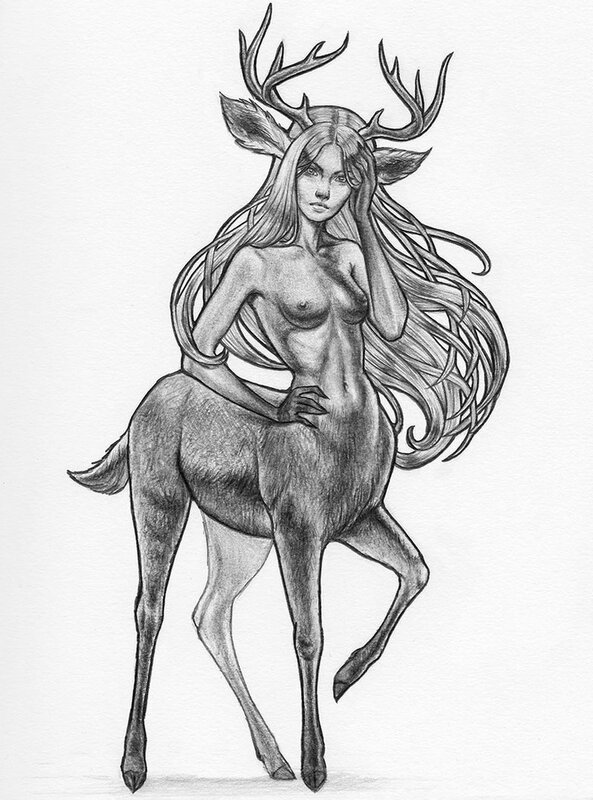 Other feature such as horns and hair can be added here to get a better concept of our character. 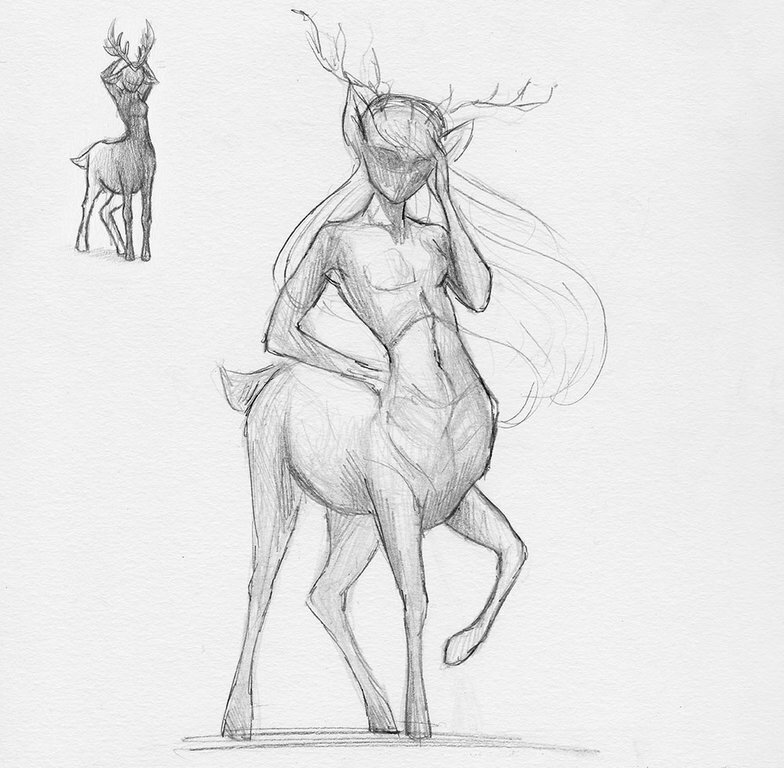 Fleshing out the figure with softly outlines and adding extra features such as hair and antlers to advance the concept. At this stage, we want to apply a base overall shade to our character. This will help with finalizing her silhouette and improve shading. Using your 4H pencil, gently massage the soft side of your pencil using minimal pressure to allow for an even coverage of a light grey using our previous line work as a guide. For her hair I have chosen to go with an Art Nouveau style by shading small strands of hair overlapping each other. I have found this technique to be the best way of recreating this style. Shading a grey tone over the whole character using the 4H pencil for a light even coverage to finalize her silhouette. Using the soft side of our HB pencil we are going to gently shade our figure and build up some shadows. Make sure you have your reference images at hand, as these will be our guide to know where to place them. Ambient occlusion is where naturally occurring shadows appear and gives the object more dimension, giving a two dimensional piece the illusion of three dimensions. This will help suggest fullness and mass to our character and improving the realism. Be careful not to press too hard with your pencil, as any mistakes can be difficult to correct with a harsher pencil. Gently building up naturally occurring shadows on character to give dimension using our reference and gently shading with HB pencil. Now we can finally apply more pressure using our HB pencil to outline our figure. This helps us define her anatomy and we can place where her features will be going on her face. 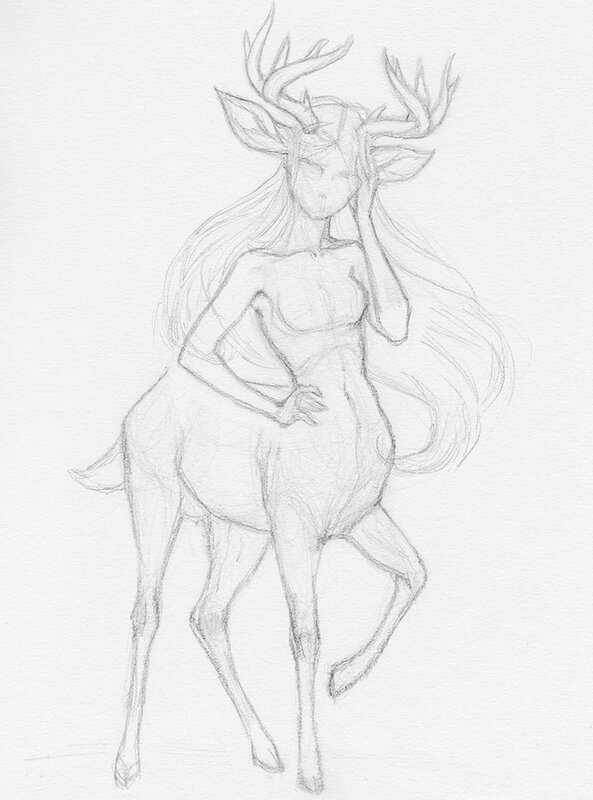 I wasn’t fond of the thickness of the antlers I’d given her, so in this stage I decided to make them more slender. I was able to successfully erase the underlying markings without damaging the drawing, due to keeping the pencil light in the previous stages. Any pencil work outside of your lines can be easily erased at this stage to clean up the drawing. Cleaning up the drawing with confident line art using a sharp HB pencil to define anatomy and place features. To give our character more volume we can add deeper shadows to increase the contrast. Determine where the light sources are and apply your shadows accordingly. This is where your reference material will help you as you can study the images and notice how the light reacts to your subjects. With both our HB and B pencil, start to gently build up the dark shadows, altering between them depending on the intensity of the shadow. At this stage it is tempting to get straight into detailing as the shadows enhance these areas. Study references and notice how light plays on subject. Determine light direction and apply dark shadows. Keeping light direction in mind, start adding details to your character; such as her facial features. For really delicate areas, I would suggest to use only your HB pencil. Keep your pressure light at first, gently building up, as these areas can be easily damaged and difficult to correct. Always keep your references at hand as they can help with direction. For fur, I like to use both HB and B pencils, altering the pressure when needed due to lighting. Both sharp and soft sides of the pencil can be beneficial and will suggest sharp and soft fibers. Add details such as facial features, hair and fur. With HB and B strengths, keep pressure light, gradually building confidence. For this stage, we can use a combination of an eraser and a white gel pen. To get a sharp edge on your eraser, cut the end off or in half. Use the freshly sliced edges to erase any fine areas of harsh light. I’d suggest starting with the face. Always be gentle and careful in these areas. Alternatively, for very tiny highlights such as the eyes, this is where our gel pen comes in. It's also useful for highlights on the hair and strands. If you’ve added too much lighting, you can always shade in with your pencils. Using a white gel pen or sliced edge on eraser, add highlights on the character. Be careful around the face. When drawing anything that exists, make sure to use reference images of those subjects to help push your work, even for lighting! This will help strengthen your mental library. You want to make sure that what you’re portraying has a level of realism and understanding of anatomy and form. Try and use a light strength pencil, such as the H range. If you mess up or want to change anything, you can easily erase with no damage to the paper. Also, try to keep your grip loose, get a feel for your subjects’ basic shapes and gestures. Keep it expressive!